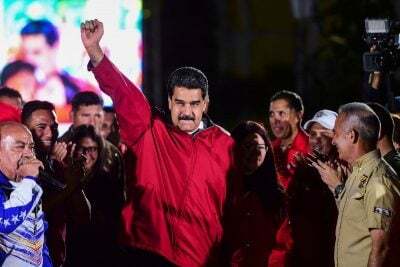 Nicolas Maduro won another six-year term overwhelmingly by a two-thirds majority – far greater than polls predicted, turnout disappointing at less than 50%. His main adversary, Chavista turncoat Henri Falcon, fared much poorer than predicted with around 21% of the vote. Businessman/evangelical pastor linked to the Panama Papers tax haven scandal got only about 11% support. Other international observers called Sunday’s vote open, free and fair, the atmosphere calm, no incidents reported, no irregularities other than minor ones corrected. Venezuela’s democratic process is the world’s best by far, polar opposite America’s money-controlled system, one-party rule with two right wings, serving privileged interests exclusively, steadily eroding social justice, heading toward eliminating it altogether – planned demise since the neoliberal 90s. Falcon rejected his overwhelming defeat, falsely calling the result illegitimate, wanting a new election not forthcoming. The Trump administration and Western media, notably the NYT, falsely claimed key opposition candidates were barred from running. Former presidential candidate Henrique Capriles was barred for misconduct. Leopoldo Lopez is a convicted criminal for leading violent anti-government protests – earlier imprisoned, currently under house arrest. Parties boycotting last December’s municipal elections had to re-register with electoral authorities. Eligibility required them to collect signatures from 0.5 percent of the electorate in 12 states. Why didn’t MUD participate? Wilpert believes it wanted more than just winning the presidency. Since Venezuela became a Bolivarian social democracy under Hugo Chavez, now under Maduro, Washington sought regime change. Multiple coup attempts to replace Bolivarian social democracy with fascist tyranny failed – in 2002, a late 2002/2003 general strike/management-led oil lockout, a 2004 recall referendum, months of likely CIA-orchestrated street violence to unseat Maduro, a 2014 plot against him, a 2005 plot to kill him, a 2017 helicopter attack on Venezuela’s Supreme Court and Justice Ministry, and a 2017 terrorist attack on Fort Paramacay in Carbobo state two days after Venezuela’s Constituent Assembly was inaugurated last August. Will another US regime change attempt follow Sunday’s election? Trump administration economic war will surely continue, likely intensify, including imposition of tough new illegal sanctions. Washington’s rage for control of Venezuela’s vast oil reserves, the world’s largest with its heavy oil, virtually assures continued Trump administration destabilizing activities ahead. Whether Maduro and Bolivarian social democracy can survive the onslaught remains very much uncertain.